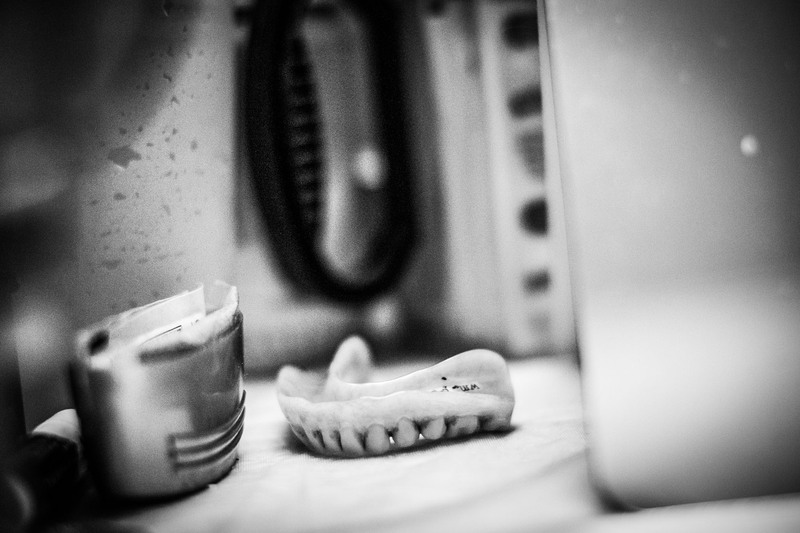 A pair of dentures sit on a bed side table in the cell of David Smith (his name has been changed at the request of the Rhode Island Department of Corrections, both to protect him and the identity of people and victims associated with his crime), a prisoner at Rhode Island's John J. Moran Medium Security Prison on December 10, 2013 in Cranston, Rhode Island. Smith, who is 70, is currently six years into a 40 year sentence for attempted murder: this is his fifth time in state prison, he has also served two sentences in federal prison. Smith says prior to his most recent conviction he was working as a mechanic, though illness and financial issues eventually led to him trying to murder his brother's wife. He now suffers from a long list of medical problems including chronic obstructive pulmonary disease, bronchitis, diabetes and ulcers. His list of medications includes an oxygen tank, 13 pills taken on various daily and weekly schedules, two inhalers and daily insulin injections. Smith is one of the rare prisoners who gets a cell to himself, due to his medical condition .Of John J. Moran Medium Security prison's 1020 inmates, approximately 50 are 65 or older.